Art comes in all shapes and sizes. And our art portfolios do, too. But, did you know that there are some common features that make an online portfolio stand out? It should be informative, polished, and 100-percent you. That’s just the start! To learn what it takes to make a portfolio go from so-so to spectacular, take a look at the five stunning portfolio examples below. We’ll break it down detail by detail to show you what really makes these portfolios shine. Amy Shackleton’s gorgeous colorful work is created using squeeze bottles and gravity—can you believe it? And her portfolio is just as stunning! Every element works together in the best way possible, and she utilizes her About page to the fullest. First, Amy reels in viewers with a colorful image showing fans what she does best—being an artist. Then she has specific sections devoted specifically to her life as an artist and her artist statement. That way, fans can find and absorb the details they are searching for as quickly as possible, helping them along the art buying decision-making process. Check out Amy’s beautiful example of an art portfolio here. 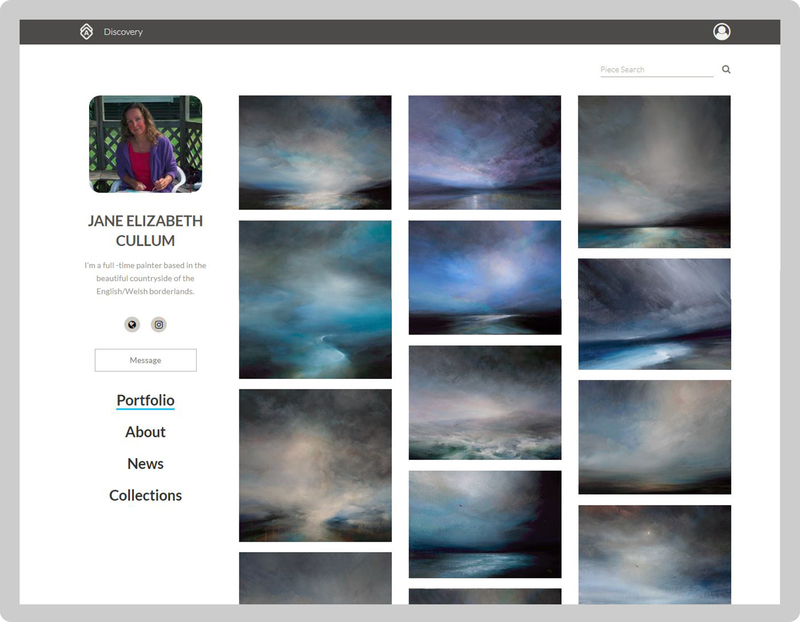 This next beauty of a portfolio is brought to you by painter Jane Elizabeth Cullum. The images of her landscapes are high-quality, well-lit, and cropped to perfection. One amazing standout on her public profile is all of the information she shares about herself and her work, including a short bio underneath her profile picture. And while it may be small in size, low in importance it is not! It introduces herself to any newcomers of the page—and a first impression is everything! You can showcase your personality while helping viewers understand your work, without even persuading them to click on your About section yet (though we think they’ll be hungry for more). You can take a look at Jane’s stunning portfolio here. 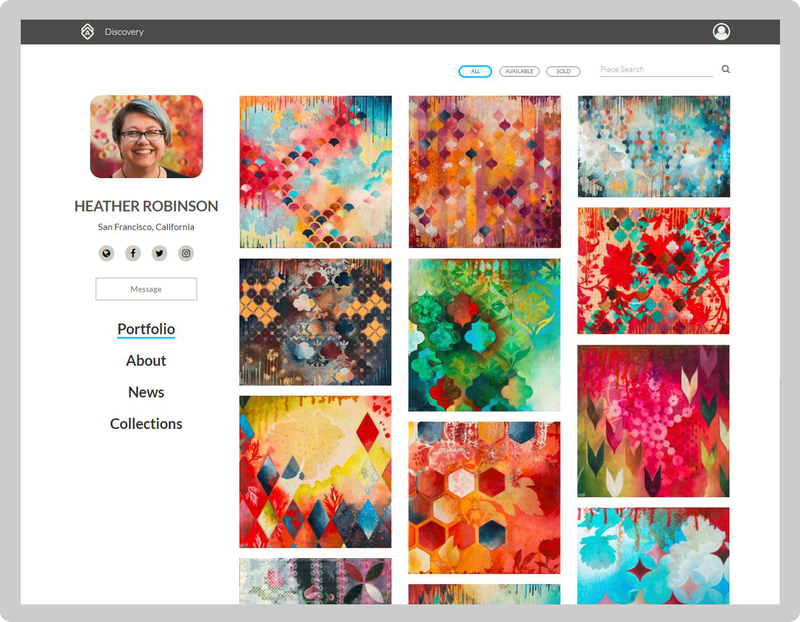 Artist Heather Robinson indiscriminately loves pattern and color. “If it’s decorated and brightly colored, I’m attracted to it,” she says. 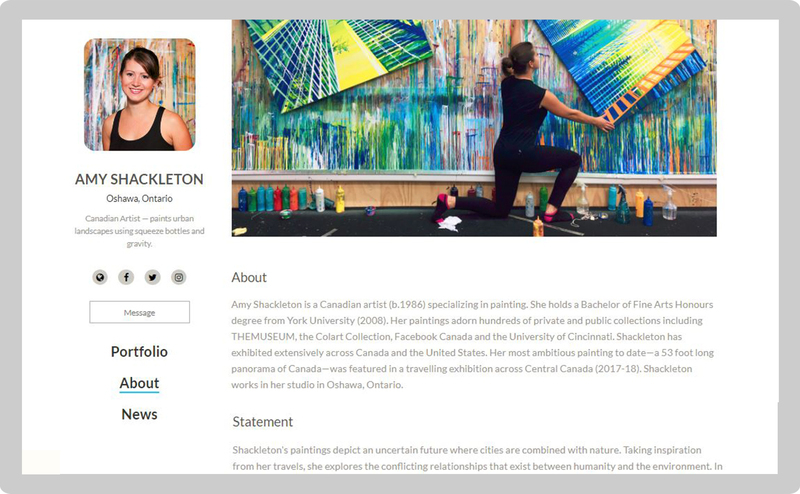 Her profile is bright and cohesive, with clear links to her social media and her work divided up into collections. And the best part? She lets her viewers into her world with updates to her News section. 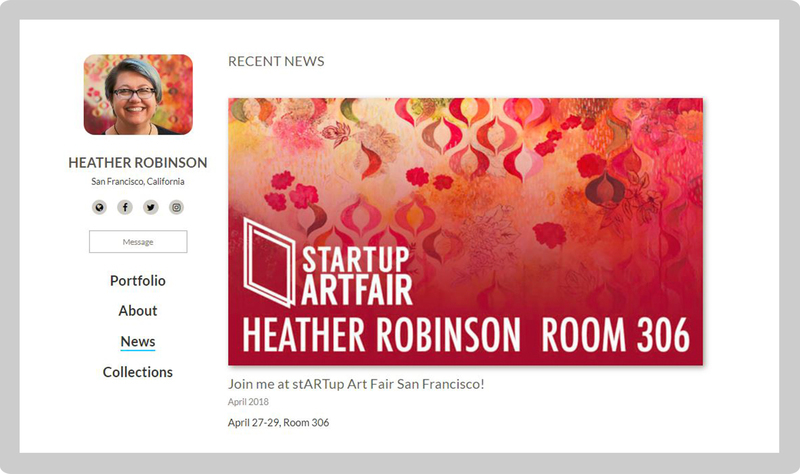 Heather added a captivating, on-brand image with her post about attending San Francisco’s stARTup Art Fair. Click on the update and she expertly provides you with the what, when, and where’s of the event. For more inspiration, check out Heather’s profile here! 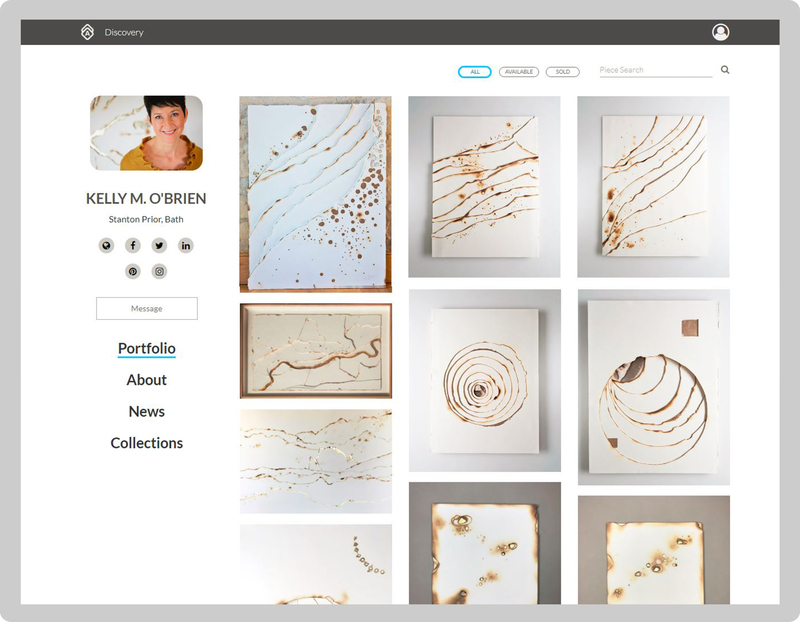 At night, we dream of mixed media artist Kelly O’Brien’s portfolio! What doesn’t it have? Her profile picture is bright, happy, and showcases her art in the background. She has so many social media links available to viewers to get further in contact. And we haven’t even mentioned all of the beautiful, clean images of her work yet. Kelly utilizes the News feature brilliantly, but she also breaks down her pages of work into Collections. When your work is broken down into collections, potential buyers can see your evolution as an artist and understand the breadth of your work more easily. It may even entice them to buy more than one piece at a time! Want a peek at Kelly’s portfolio? You can check it out here. The beauty, essence and changing complexion of landscapes fascinates artist and photographer Lee Anne White. And, she carries that beauty over to her portfolio. It is completely and beautifully branded. In other words, as soon as you open her portfolio, you understand the type of work she creates. The clean grid formed by her square dimensions feels bold and modern. Another amazing feature of her portfolio? She includes just the right amount of detail when you click on each piece! Surrounding her piece, Lee Anne includes the information collectors need and want when deciding to make a purchase. Medium, dimensions, price, and even a description of the piece like Lee Anne has featured gets down to basics and gives buyers a clear idea of what they are looking at. The less digging they have to do, the happier they will be. And, why not make it as easy as possible for collectors to say “yes” to your artwork. 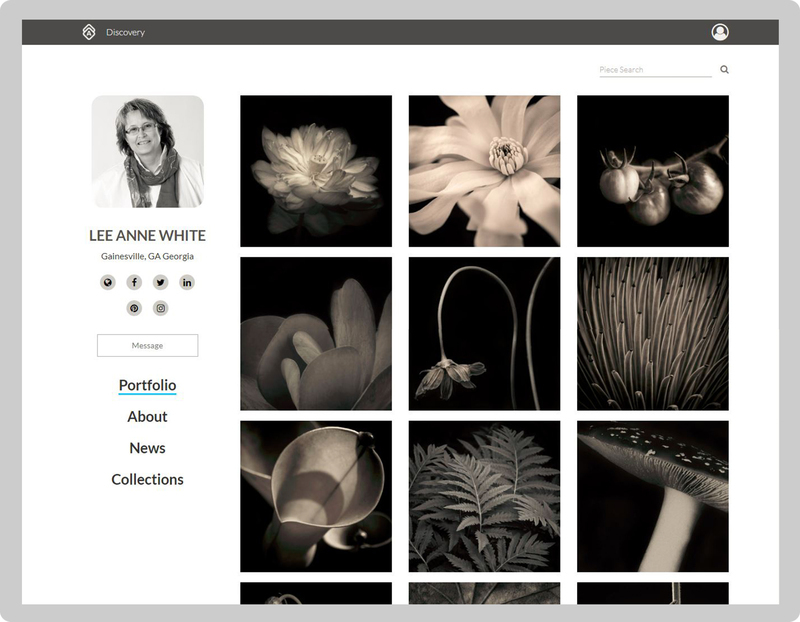 Get more inspiration from Lee Anne’s portfolio here. 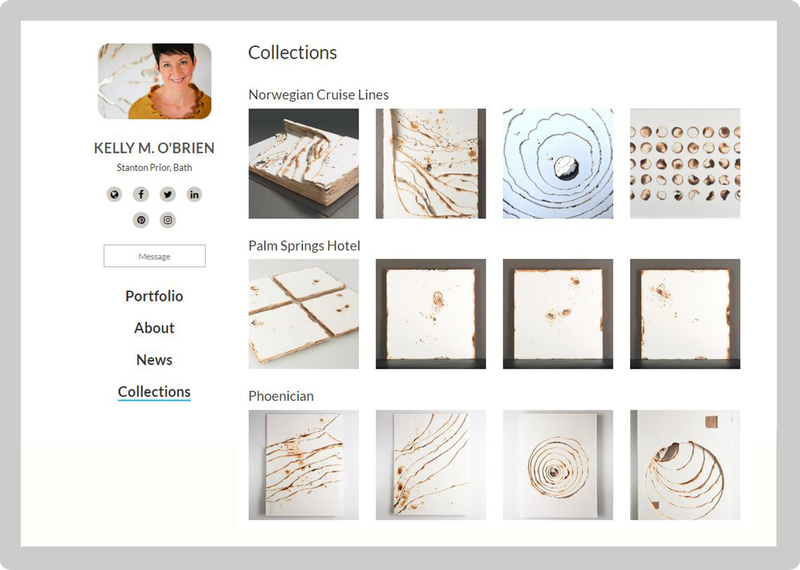 Many different qualities come together to make a beautiful portfolio: high-quality images, a good profile picture, the latest news about your art business, ample information in your bio and artist statement, social media links that work correctly, pictures throughout to entice your viewers, and more. And, having a beautiful portfolio to present to potential buyers can make or break an art sale. Your portfolio is a reflection of you, the quality of your work, and your professionalism as an artist. So, how can you develop as beautiful of a portfolio as these featured artists? Artwork Archive's new public profile. 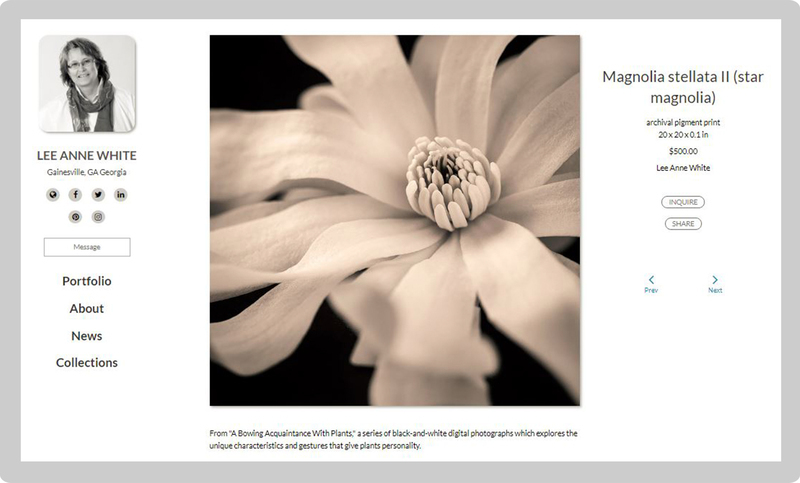 The Public Page is a sleek and professional online gallery for your art ready to present to clients. The cherry on top? It’s linked straight to your art inventory, so no fussing with code or re-entering images and information you already have stored somewhere else. It’s the best way to show collectors the scope of your work, keep them informed, and explain who you are as an artist. A win-win for everyone! 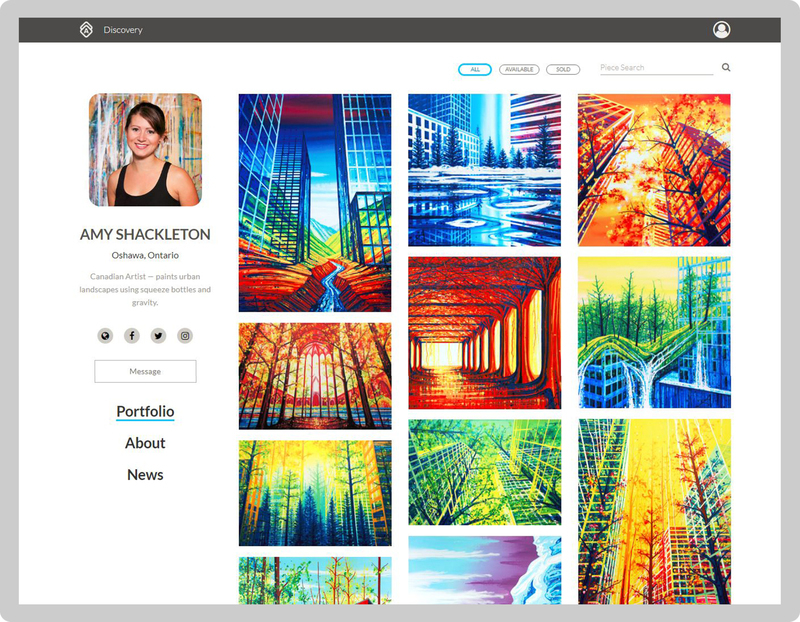 Want your own stunning online portfolio? Head over to Artwork Archive and get started with your free 30-day trial. Yes, social media works, and it could work for your art business.